Effective Patterns: #10 Pats Rubber Legs, Egg patterns, #14 San Juan Worm, #18 Buckskin, #20 -22 Juju Baetis, #20-22 Choc Foam Wing Emerger, #22 Stalcups Baetis, #20-22 Mercury Midge, #20-22 Pearl Jam, #20-22 Manhattan Midge, #20 Pale Olive Midge Larva, #22-24 Black Beauty, #22-24 Bling Midge, #22-24 Top Secret Midge, #22-24 Minute Midge, #22-24 Jujubee Midge, #22-24 Matt's Midge, #22-24 Griffith Gnat, and #24-26 Parachute Adams. The Colorado River begins its journey in Rocky Mountain National Park and heads west offering anglers several opportunities to sample this great stream. Near the small community of Granby is the confluence of the Fraser River. At this point the river is a meandering, meadow stream flowing through lush ranchland and the river remains this way until it hit Byers Canyon. Byers Canyon is only about 3/4 mile long and this section is tough to negotiate, especially during higher flows. Below Byers Canyon the river is “as good as it gets” with many access points including Paul Gilbert, Lone Buck, Kemp-Breeze, Sun Set Ranch, Powers Unit, Reeder Creek and the Pump House to Radium stretch. The Colorado is lined with cottonwood trees and willows and is a dry fly paradise. 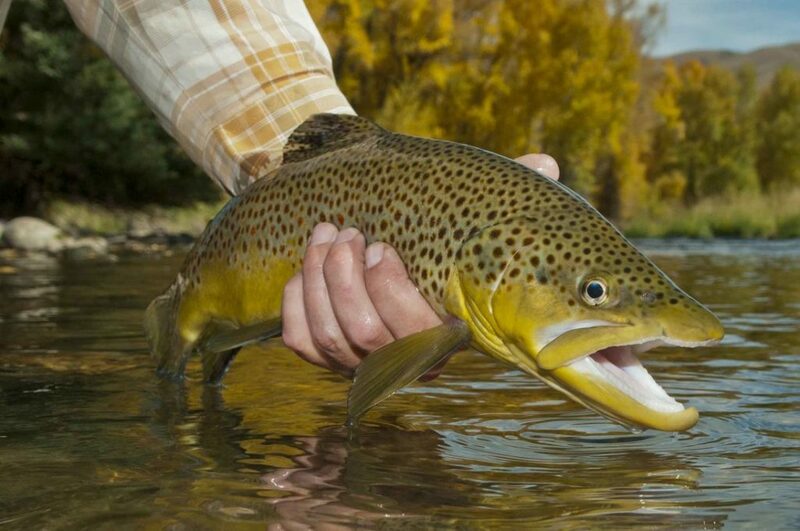 Anglers can expect to catch a mixed bag of both browns and rainbows. The regulations in this area are flies and lures only and all fish must be returned to the water immediately. Fishing the Colorado River should be on everyone's bucket list. Whether you're a walk/wade fisherman or prefer float-fishing, this river has something for everyone! The Colorado is experiencing the onset of spring run off, but fishing is currently pretty good. Flows will vary depending on warm weather trends. If it gets warm, expect the flows to bump up, and if it gets cool, expect them to drop a bit. Currently the flow is about 370 cfs in Parshall, and the water is stained from snow melt. The lower river is is around 750 cfs and fishing well. There is a bit of color in the lower river too, but it becomes an advantage for the angler. Anglers are picking up some quality rainbows and browns. On the lower river anglers should prepare themselves for reliable hatches of midges and blue winged olives. Up near Parshall, the olives have not started yet, but should in the days to come. Fishing has been good there too, but the fish have been quite a bit smaller in comparison.